This easy to use, automated online booking system is intended to speed up the room booking process. You can see at a glance which time slots are free and which are not. The system is designed to act on a first come, first served basis so that double bookings are avoided. Please note that you must clearly state your name and provide contact details as well as the title of the event when booking the Conference Room. Please note that bookings without these details will not be accepted. Contact Details: Please leave your Name / Tel Number / E-mail Address each time you make a booking. Event Date: The system requires you to enter the date on which the meeting will be held. Block bookings: In the case of block bookings, please enter the relevant dates individually. N.B. 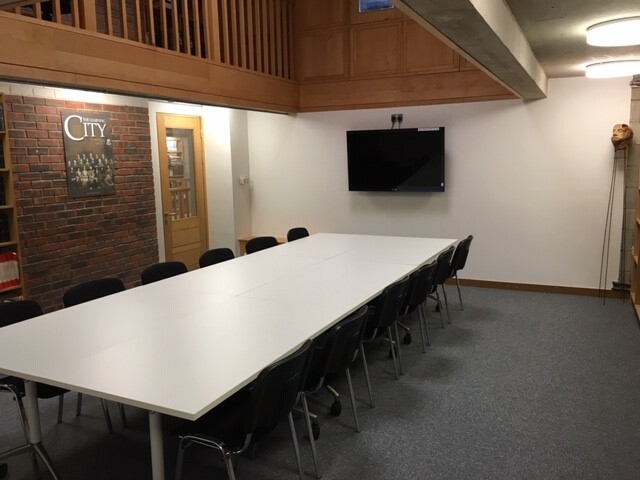 Please note that the Library requires that all furniture in the Conference Room is returned to the original layout (as seen in image above) before vacating the conference room. The Library Conference Room has to be vacated by 9.30pm at the very latest. Meetings, presentations, conferences should all finish by this time. Please avoid provisionally booking the Conference room & please remember to cancel a booking if you no longer require the room. Please e-mail us to cancel or amend any bookings. The Conference Room is to be used only for bona fide academic purposes, meetings, conferences etc. It is not to be used for scheduled classes. Block-booking of the staff conference room for consecutive weeks or consecutive slots is prohibited. Since this room is always in heavy demand, we would ask that you look for alternative accommodation throughout the Institute if you need a room for a consecutive period of time. The Library Conference Room is for staff use only. Students requiring a group study room, should reserve one of our Study Hubs. N.B. Please note that all bookings are at the discretion of the Library and are monitored by an Administrator on a regular basis. *It is important to note that Library Staff are not responsible for any problems that arise due to incorrect booking details being entered at the booking stage.